From sunken to solid & safe. 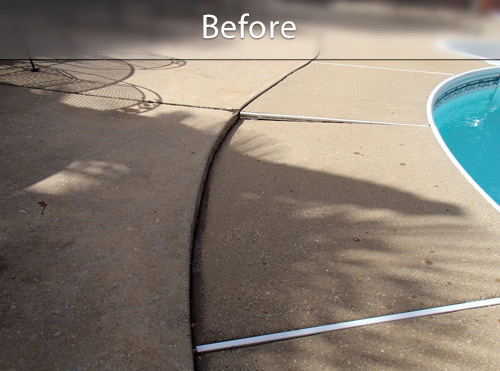 Soil that settles or washes away beneath a pool deck can be a disaster waiting to happen. PolyLevel® effectively solves this problem by leveling sunken concrete, filling voids and consolidating loose soil. Pool decks are treacherous enough, with curbs, coping stones, diving boards, ladders, slippery wet areas, and, of course, the pool itself. Add tripping hazards to the list, which is a result from sunken sections of concrete pool decking, and pools become even more hazardous. For example, a 2- or 3-in. differential between a sinking deck slab and the coping stones bordering the pool is not uncommon. Tripping hazards around a pool are especially worrisome and can potentially lead to tragedy. There are several ways to repair a trip hazard around an in-ground pool. They include mudjacking, sand-jacking, demolition and replacement, and grout filling. But the fastest and neatest way to improve pool safety, without shutting it down for more than a few hours, is with pool deck leveling using the PolyLevel® polyurethane injection system. Your local PolyLevel® dealer offers free estimates for this service - contact them today by clicking below! When making repairs using the polyurethane injection method, or poly-jacking, as it’s sometimes called, very little of the pool area needs to be disturbed. Some small holes will need to be bored through the sunken slab sections. A hose is then pulled to the repair site, and specially formulated polyurethane foam is pumped through the holes into the weak or eroded soil under the slab. The foam spreads throughout the area, filling gaps, voids, and even the tiniest cracks, turning into a sort of structural pillow. Carefully monitored and controlled expansion of the foam raises the sunken slab until it returns to its original, level position. What do you do if your concrete pool deck hasn’t sunk, but it sounds hollow? PolyLevel® engineers have several formulations in their arsenals, each tailored to the demands of the job. If your soil has settled or eroded from beneath your concrete slab, a non-expanding, void-filling polyurethane and catalyst resin may be used to fill voids and encapsulate loose soil. Not sure what the right solution is? Find your local PolyLevel® contractor and allow us to inspect your pool deck and supply you with a Free Estimate for pool deck lifting and leveling. 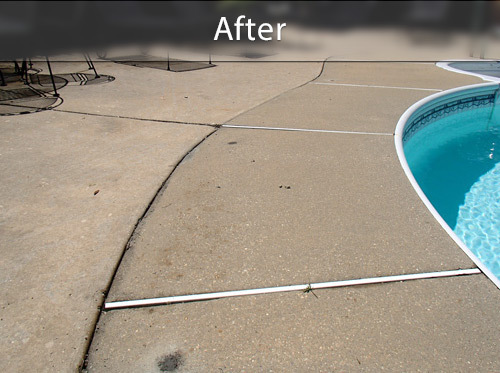 Most residential concrete repair and pool deck raising jobs can be completed in just a day with a crew of one!